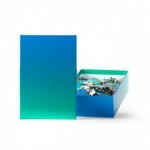 The Gradient Puzzle is a vibrant way to meditate on color. The act of putting it together is slow and deliberate, where the color of each piece is used to locate its proper position. A thick stock and high quality art paper is used, so the puzzle can be assembled again and again without losing its edge. The colors in this puzzle have been arranged to suggest that there exists no precise point on the chromatic scale at which one color becomes another. The puzzle can be considered complete even when its pieces are disassembled and mixed together in the box.